I'm sorry to my heart. I'm sorry because you're a good heart. You have a lot of compassion, a lot of passion, a lot of energy, and positive motion to give to the world. I'm sorry I haven't given you time to feel because when I don't give you time to feel I end up all cynical and bitter. And that's not really what my heart feels... not deep down. I'm sorry to my heart. I'll do better. I've found us a safe quiet space that is becoming a home. A safe space where you, heart, can feel and process and think and be quiet and still. I've found a space for us heart, I'm trying to do better for us. I've even got plants and live things in this beautiful place and it's really turning into quite a home. I'm trying to do better for us, heart. It's not fair. It's not fair all the things you've seen, heart. All the things you've seen and talked about and bore witness to. It's not fair. I don't know how to protect you from the injustice of the world, heart, because it's all around us, it's all around me every day. Heart, you're so beaten and bruised and deformed from the extent of brokenness you've seen and experienced. I'm sorry heart. I know my God will heal you. And I know it's my job to create a space for that, heart. To listen to you, my heart. To stop avoiding, to stop working, to stop all the deeds, to stop comparing myself to all the poor and suffering that are on my doorstep daily, and for a minute, to listen to you, heart. To recognize you, heart. To acknowledge you, heart. And most importantly, to feel you, heart. I'm sorry I haven't let myself feel you, heart, I promise I'll do a better job of that. There's beauty all around us, heart, Even in this broken world, there is. And we can't see the beauty and simplicity in the every day life if I don't listen to you, heart, and let you speak, heart. I will let your voice be heard, my heart. I will spend more time listening to you, heart, and giving you space and time to feel... the pain, the suffering, the grief, but also the beauty, the miracles, the simplicity, the relationships, the freedom. You have a strong voice, heart. A voice I've tried to stifle and silence and avoid and neglect. I'll give you the space and safety to speak your voice, my heart. I will listen to you and honor you and be kinder to you, my heart. I love you my heart. You have been good to me. You are kind. You are strong. You are smart. You have a lot to offer this world, my heart. I'll do better, my heart. I'll do better. 3. By 30, I feel so much more comfortable in my own skin. I have an idea of how my body works - how it responds to stress, what foods work best with it, the ideal weight for me, what sort of exercise it needs, and more than ever, how to listen to my body. This world that we live in is ripping me up. I can't imagine how God feels because He sees it all and knows it all. I see just a pin point of the world's suffering and it's enough to spiral me into a depression. I live in this world where children are sent to orphanges because their parents can't pay for an education. These desperate parents don't understand the vast consequences of their actions. I live in this world where 'orphanage directors' often known as 'pastors' pay for children to live in their orphange, traffic children, and exploit children to attract white people to partner with their orphange in order to make money. I took my passport to the post office today to spend quite a bit of money to get my passport renewed. Thirty six stamps representing 36 times I came and went from Haiti over the past 3 years. 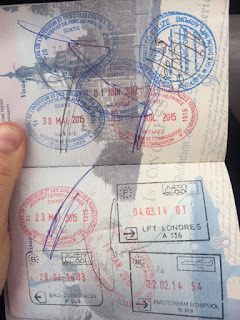 Thirty six stamps of privilege to be able to have an American passport and travel freely. Thirty six times to navigate the airport and all its chaos and complexity. Thirty six stamps to represent how I now feel, as though I have two homes and I am always missing one no matter where I am. Thirty six stamps of the come-and-go missionary life. The transient life. The life that I laid down in service, pursuit of justice, and absolute love for a new home. Thirty six stamps represent how much my 'developed world' passport including Spain, Italy, France, Great Britain, Monaco, the Netherlands, and Belgium was crashed under the new weight of how the 'rest of the world' lives. God. Haiti. Coffee. People. Relationships. Health. Wholeness. Pain. Injustice. Hope. Medicine. Clinic. Physical therapy. Sunsets. Wine. Rest. Joy. Healing. Learning. Always Learning.